Should Bugs or Boats Take Priority? 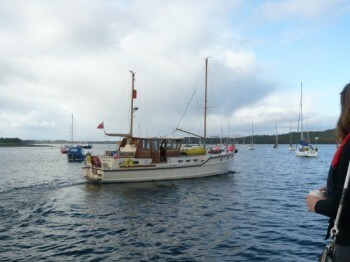 A few years ago I was anchored in one of my favourite hideaways in Loch Sunart, west of Oban, when two unsmiling characters in a RIB came alongside requesting I should move as my anchor could be damaging marine life. Bureaucrats have never been on my list of favourite people and, having anchored regularly in the same spot man and boy for over fifty years, my first inclination was to resort to the colourful words sailors use when they drop an anchor on their foot, and tell them to go away. But it was a nice morning, the weather was set fair, I had enjoyed a good breakfast and was at peace with the world. So I invited them to explain what the problem was and discovered that my anchor might, only �might� mind you, be squeezing the life out of an aquatic bug that had a name as long as a Welsh road sign, was barely visible to the naked eye and of interest to no-one except a scientist. It seemed utterly ridiculous to be asked to move for such a trivial reason, and I suggested to the odd bods that they probably caused more damage in an hour to the marine environment by tearing up and down the loch in their RIB than I had done in a lifetime of anchoring in my favourite pool and what�s more, I said, I had talked to fishermen who had found seals in their nets that had obviously been killed by a boat�s propeller. That stopped them in their tracks and without another word they drove away and I never heard from them again. It all sounded very plausible, but then the boffins came out of hiding and revealed their interpretation of Finnie�s dream by descending on Loch Creran, a popular anchorage north of Oban, and publishing a map showing proposed prohibited anchoring areas and a brochure which stated, �Mooring and anchor placement for recreational use has the potential to cause significant physical damage to the conservation interest of the site.� They were careful to single out �recreational use� as the culprit; the loch was the very active base of a company with a fleet of fast boats serving a massive granite quarry on the shore of nearby Loch Linnhe, and in the Highlands the word �jobs� can literally move mountains. Superimpose the boffins� chilling statement over every popular anchorage in Britain and the extent of the threat to the freedom to roam for boat owners starts to rear its ugly head. Preservation and conservation will be the buzz words, and as well as being controlled by a bunch of Government-appointed civil servants, very likely with as much experience of the sea and the maritime environment as I have of Mongolian camel breeding, a lot of influence will be wielded in Scottish lochs, English, Welsh and Northern Ireland bays and estuaries, and around islands designated a conservation area by marine biologists sounding off about the urgent need to protect species and habitats. Having thrived merrily for generations in anchorages regularly used by cruising boats, obscure little bugs will suddenly be declared to be endangered and restriction orders placed on boating activity with all the powers of the law that Government quangos are able to call on. Seal colonies, whale and basking shark breeding grounds, seabird nesting places and even seaweed beds could easily be labelled Sites of Special Scientific Interest, and the unrestricted freedom of sailing and anchoring we have enjoyed for centuries around the coast of the British Isles will be lost forever. Someone will have to patrol restricted areas and my bet is that the Government would add it to the work of the Customs and Excise launches supposedly on the lookout for drug smugglers. New marine conservation byelaws could see them charging around ready to slap an instant fine on a boat owner who has allegedly dropped his hook too close to the lair of a microscopic limpet. The future survival of the underwater world and the creatures that live in it should be the concern of everyone who gets pleasure from the sea, but there is a real danger that, unlike terrestrial national parks where freedom to roam is protected, the objective of marine national parks and conservation areas would be severe restriction. During a lively conversation about the political influence over National Parks in the UK with one of the UK�s best-known politicians of his time when I worked for BBC Radio, I asked him for his reaction to the possible introduction of future marine national parks and whether there would any restrictions on the freedom of movement of pleasure boats. He replied �Everyone living in the British Isles has the hereditary right to put to sea in a boat and sail our coastal waters unhindered.� A few tides have gone by since the plain-spoken Lord Whitelaw made that statement and anyone who owns a boat nowadays is only too aware of how the canker of bureaucratic interference is eating into that �hereditary right to put to sea�. It is to be hoped that the Royal Yachting Association are taking very seriously the implications of the spread of marine conservation areas and marine national parks, and of the stream of new rules and regulations, affecting small boat owners, pouring from the office-bound gents in the Maritime and Coastguard Agency like a virulent form of incontinence for which there is no palliative. It might help the Hamble-based RYA moguls to fully appreciate the conservation nightmare if they imagined their sacred Solent being declared a marine national park; and boffins, claiming to have discovered an endangered aquatic species, slapping SSSI notices on the Beaulieu river, Lymington and the Isle of Wight harbours, banning moorings and all pleasure boat movements. It could never happen? Don�t you believe it! Man; you should come over here to see what "restrictions" REALLY means. The ICW in Florida is one LONG restriction! Love your site, by the way.